Zaracon Boxers, reg'd is pleased to introduce our litter between Secret and Declan. Both are health tested for eyes, hips, thyroid, degenerative myopathy, and heart (sub-aortic stenosis and cardiomyopathy / ARVC). It is our very first Zaracon to Zaracon breeding! Secret comes from a litter of six (three of which are Canadian champions, plus one has an obedience title and another has numerous agility titles). This is Secret's second and final litter. She is currently the dam of four Canadian champions from her first litter, with one other from that litter pointed. Declan comes from a litter of ten (five of which are Canadian champions). He completed his Canadian championship as a puppy and was shown selectively in the States for his American championship. He’s a multiple Best Puppy in Group winner, a multiple group placer, and has multiple breed wins in both Canada and the United States. Declan has also done extremely well in American and Canadian Boxer Specialty shows. 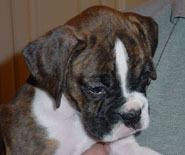 Declan was the Top Boxer Puppy in 2007 with the Boxer Club of Canada (this was a shared honour). This is Declan's first litter. This is a linebred litter and it is ABC Futurity nominated for 2011. Six puppies were born on 29 March 2010. 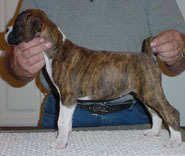 There are two males and four females: one plain brindle girl, one flashy brindle girl, one white girl with two brindle patches, one white girl with one brindle patch, one plain fawn male and one flashy brindle male. Scroll to the bottom of this page to find links to puppy pictures.